Home / News Blog / Attention Adelaide Customers! Are your trees in need of care? We provide quality service to the Adelaide region. 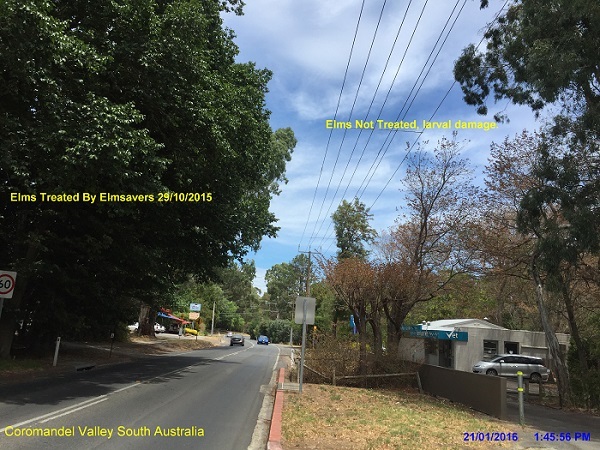 If your trees are showing signs of infestation or infection Elm Savers can help, even if you’ve had disappointing results from prior treatments. If you’ve hired a local contractor and experienced a failed treatment don’t be discouraged – we have served many customers who have had unsatisfactory results from such situations. We provide successful outcomes for rebound clients, bringing relief from worry to those who care about their trees. We specialise in eliminating a wide variety of ailments, from Elm Leaf Beetles and Leaf Spots to Fruit Tree Borers, Monterey Pine Aphids, and more – including fungal diseases such as Plane Tree Anthracnose and Cypress Canker. It’s not uncommon for standard treatments to fall short of success for many of these problems. When others have proven ineffective, specialists like Elm Savers can administer solutions. We provide the guarantee of experience, gained from saving trees for 20 years. We have public liability and professional insurance alongside a Full Pest Management Technician’s license for South Australia. If you’re in Adelaide and have trees that need treatment, even if others have left you without hope, fill in our enquiry form or give us a call at 1300 356 728 to get your tree back in good health. Proof of effect from South Australia! Read about our successful treatment for Onkaparinga Council.